There is nothing worse than spoiling a gorgeous pond installation with the sight of a big skimmer lid on the side of the pond! 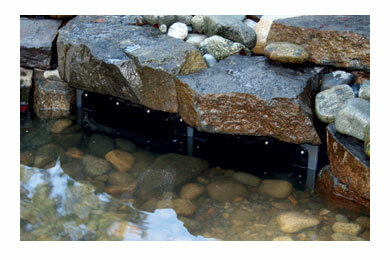 Our door skimmer allows for a very small footprint in the waterscape. The single door skimmer has a footprint of just 6-1/4" x 12" and the double with 6-1/4" x 23" They are very strong and can be placed underneath rocks or logs. Aside from the small footprint, our door skimmer also provides a front port for a bottom draw. The huge advantage with the built in port is that only one incision in the liner needs to be made (for the skimmer) as the bottom draw discharges into the skimmer intake. If your installation is in need of ultraviolet filtration our UV Vault is a simple and effective solution. Designed to be placed on the pump discharge the UV Vault houses a 57 watt ultraviolet filter which does a great job at keeping the water clean. Housed in a 15 gallon vault, the uv element is kept debris free and away from the pumping components. For large installations, multiple UV Vaults can be attached in parallel to accommodate the additional flow. Large pond systems often times call for more than one draw point. Our Remote Filter Skimmers accomplish this task seamlessly. 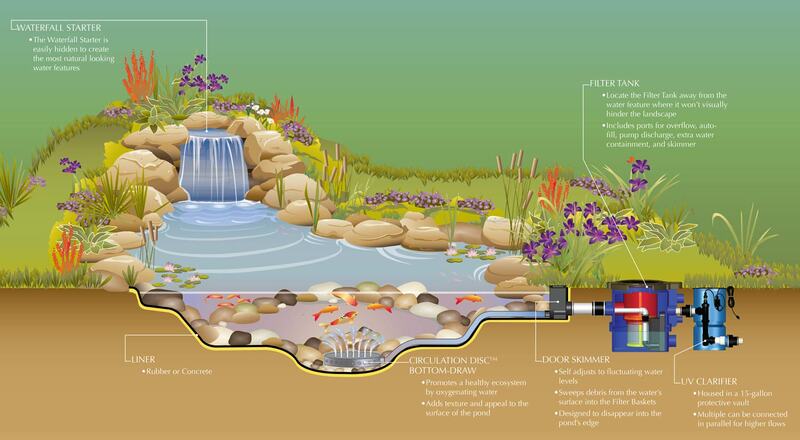 Each Remote Filter Skimmer is designed to be connected to either a Door Skimmer or Bottom Draw and can be placed around the water feature. Each Remote Filter Skimmer houses a Filter Basket within it’s 15 gallon vault. 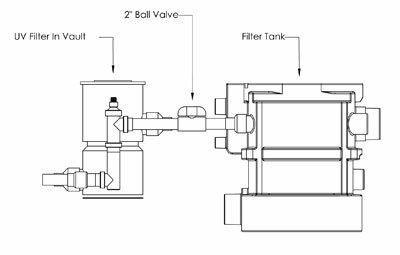 The real advantage to filtering at multiple spots around the pond is that the return line to the filter tank can be plumbed in separate from the intake port thus increasing the maximum flow of the Filter Tank. It’s a great way to ensure that the pond will not have stagnate pockets and also increases the maximum GPM of the Filter Tank! When it comes to filtration, we offer the most customizable solution, hands down. Inside each Filter Tank are either one or two stainless steel Filter Baskets. The mesh sizes on these baskets are customizable, and can be interchanged to match the filtration needs of the project. In all, there are 5 different mesh sizes to choose from.